Particular events in an election campaign can come to take on a mythical status and be credited with being the sole reason for victory or defeat. In hindsight, for example, it is obvious, claim the pundits, that the "triumphalist" Sheffield Rally was a disaster for Labour and that John Major's decision to get up on a "soapbox" during the campaign was a stroke of genius. But rarely do such events tell the whole story or add much to our overall understanding of why the voters behaved a certain way. Interpretation of these events is largely dependent on the final result. If Major had lost the election analysts would still be deriding the soapbox gamble as naive and praising the Sheffield Rally - which, according to electoral experts Butler and Kavanagh, Labour's own polling showed had little impact on voting behaviour - as the moment when victory was clinched. During the campaign the Prime Minister attended a series of "Meet John Major" talkabouts, at which he fielded questions from an invited audience of 200-300 people. Seated on a barstool in the middle of the hall, following a brief introduction from his "warm-up man" Jeffrey Archer, he would respond to questions from the audience. Mr Major was seen to be his party's strongest asset in the campaign and "The Meet John Majors" were intended to exploit his ability to communicate directly with real people. However, during the campaign Mr Major came to feel that this imported American technique was too orchestrated and that he was not getting close enough to the "real voters". So, in Luton on 28 March he produced the now famous soapbox - an innovation which according to Prime Ministerial adviser Sarah Hogg came to him on the spur of the moment. Amidst much barracking, and to the consternation of the detectives minding him, Mr Major verbally battled with the crowds on a hand-held megaphone. Although the initiative did little to get the Prime Minister's policies across to a wider audience it did reinforce the voters' image of the Prime Minister as "honest John". It also had the added bonus of personally invigorating John Major and increasing the interest-level of the media in what they were beginning to write off as a lacklustre campaign. As the 1992 General Election campaign opened there was much talk of hung parliaments as no single party seemed able to establish a clear enough lead in the opinion polls to secure an outright victory. This put a tremendous focus during the campaign on the Liberal Democrats, who remained firmly committed to their policy of equidistance, under which they made it clear they would be prepared to sustain either of the main parties in the event of a hung parliament in exchange for a commitment on proportional representation (PR) for elections to the Commons. The Conservatives remained implacably opposed to proportional representation and throughout the campaign Mr Major made this clear, giving the impression - possibly - of a man who believed his party could win alone. On the contrary, the Labour Party had spent much of the latter part of the 1980s agonising over electoral reform. Successive election defeats appeared to show that it was going to be very difficult for any left-of-centre party to win outright under First-Past-The Post (FPTP). By 1992 the party was in the middle of a review of electoral systems in the UK, which was being headed by Professor Raymond Plant (now Labour peer Lord Plant). The Plant Commission, as it came to be known, was not due to report until after the election, allowing Labour to go into the campaign with an open mind on the issue, although many senior figures such as Roy Hattersley were firmly opposed to PR. The policy left the door open for negotiation with the Lib Dems in the event of a hung parliament and Labour also hoped its "warm words" on PR would attract Lib Dem voters to switch to Labour. However, in the campaign the issue did more harm than good to the Labour Party. As talk of hung parliaments intensified in the latter part of the campaign, Neil Kinnock let it be known at a press conference on Friday April 2 - Charter 88's Democracy Day - that Labour would like to see other political parties (namely the Lib Dems) join the working party being headed by Raymond Plant. This seemed to affirm the Prime Minister's accusation of the previous day that the Lib Dems were the Labour Party's "Trojan Horse". The weekend papers were full of speculation about possible deals in a hung parliament and the manoeuvring of Mr Kinnock began to make him look untrustworthy and weak against a Prime Minister opposed to such "deals". On 6 April a story in The Times suggested that Mr Ashdown would demand four seats in a Labour Cabinet. But the story looked presumptuous and although, according to Butler and Kavanagh, it came from a good source, Mr Ashdown was forced to deny it. By now Labour's decision to talk about PR seemed to be backfiring disastrously and when on 6 April Mr Kinnock refused to be drawn on his personal view on PR on the Granada 500 election programme, his credibility as a Prime Minister-in-waiting was further damaged. Potential Lib Dem voters frightened of letting in a Labour government switched back to the Conservatives. It was clear going into the '92 campaign that tax was going to be a central issue. Labour had worked hard since 1987 to neutralise its image as a high tax-and-spend party. With the steady, bank manager-like John Smith as Shadow Chancellor, and the tenacious Margaret Beckett as his deputy, firm spending commitments had been kept to a minimum and Labour hoped to be able to persuade the voters that it could be trusted on tax. All Labour Party policy proposals were carefully costed and the party was determined to give the Conservatives no scope for scaring the voters with the claim that Labour would put up their taxes. However, as early as the summer of 1991 the Conservatives had launched an offensive on Labour's spending plans, costing their proposals at �35 billion and in the New Year it became clear there would be no let up. On 6 January 1992 they unveiled the "Labour's Tax Bombshell" poster campaign, in which it was claimed Labour's plans would mean tax increases of more than �1,000 for the average voter. In an attempt to neutralise Tory attempts to raise fears in the voters minds about hidden tax rises, Labour decided that it would produce its own Shadow Budget setting out in detail its tax and spending plans. This was presented on Tuesday 17 March, just six days into the campaign and seven days after Chancellor Norman Lamont's real Budget had been presented to the Commons. Labour's "Budget" proposed an increase in the personal allowance of �330, of particular help to the lower paid; an increase in the top rate of tax from 40% to 50%; and removal of the exemption from 9% National Insurance contributions on high earners. Labour claimed 8 out of 10 voters would be better off under its proposals. In particular, those at the lower end of the earnings scale would be much better off. Labour claimed that a single person on average earnings would be over �100 per annum better off and that the average two earner family with two children would be �311 per annum better off. Higher earners on the other hand would be much worse off. A married couple with one earner on �40,000 would be approximately �150 a month worse off. During the election campaign the Shadow Budget was pretty well-received, although in hindsight many commentators claimed Labour's openness on the subject had proved a tactical error. However, it is unlikely that the Shadow Budget had any specific impact. It was an attempt by Labour to rebut Tory propaganda about its tax plans, but by the election the Conservatives long-run campaign to plant in the voters' minds the fear that they would all be worse off under Labour seemed to have borne fruit. 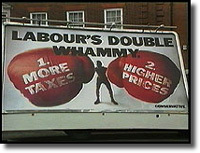 This was an extremely successful campaign poster and slogan used by the Conservatives which featured a boxer under the slogan "Labour's Double Whammy". In the foreground, on his boxing gloves, appeared two short statements, "1. More Taxes" and "2. Higher Prices", i.e. what voters would get under a Labour government. Chris Patten, the Conservative Party Chairman, came up with the phrase 'double whammy' which proved so successfull and new catchphrase entered the British political lexigon. The poster was designed by Saatchi and Saatchi. Maurice Saatchi described the companies approach to political advertising as," A world of trial by combat, in which you would hit and be hit." Party Election Broadcasts (PEBs) - "Jennifer's Ear" and "The Journey"
On Tuesday 24 March a Labour PEB on health was shown which proved to be one of the most controversial events of the campaign. Directed by Mike Newell, director of the film "Dance With a Stranger", the PEB told the story of two little girls with an ear problem, commonly known as "glue ear". One girl was forced to wait for treatment because of NHS underfunding, whilst the other child went private and was treated without delay. The PEB was widely praised as powerful drama and Labour hoped it would shore up its already strong lead on the health issue. However, the PEB ended up distracting from Labour's health message because of controversy over the real-life case on which it was based. Reports appeared in the following day's papers that the broadcast was a fraud. The Daily Express had been put in touch with the child's surgeon (by the Conservative Party it was later revealed) and questioned the authenticity of the account that had been shown. The Sun ran a story which asked "If Kinnock will tell lies about a sick little girl, will he ever tell the truth about anything?" For the three days following the broadcast, instead of focusing on the issue of health as Labour had intended, the media focused on the question of who had leaked information about the girl's family and on the ethical questions the PEB had thrown up. Amidst intense media speculation, Neil Kinnock's press secretary Julie Hall admitted, on 26 March that the PEB was based on the story of a real child and let slip that her name was Jennifer. Eventually Jennifer Bennett was traced and it was discovered that her grandfather, a staunch Conservative, had informed the Conservatives some time before the broadcast of what Labour were planning. The "War of Jennifer's Ear" did little to enhance Labour's reputation for competence and ended up damaging Labour on an issue that it was hoping to exploit to the maximum effect. The other most memorable PEB of the 1992 Campaign was "The Journey", shown on Tuesday 17 March. This was directed by John Schlesinger, director of Midnight Cowboy, and in it John Major was seen visiting Brixton, where he had been born and brought up. Although the Prime Minister was reportedly reluctant to exploit his humble origins the PEB was seen as an ideal way of reinforcing the image of John Major as in touch with the ordinary people of Britain, untainted by the excesses of Thatcherism and the perceived failures of the Thatcher administration such as the poll tax. It also reminded voters of the Conservative Party's commitment to provide opportunities for everyone to get on in life. According to Sarah Hogg and Jonathan Hill in their book Too Close to Call, the PEB cost about �250,000 to make. The Sheffield Rally took place on 1 April, just one week before polling day. Labour's strategists had been working on the rally for over eighteen months. According to Richard Heffernan and Mike Marqusee in their book "Defeat from the Jaws of Victory" the rally was the brainchild of Philip Gould, a key player in Labour's shadow communications agency, and cost the party over �100,000. The rally was reminiscent of a US-style political convention. It was held in the Sheffield Arena, built to house the World Student Games, and attended by 10,000 party members and the entire Shadow Cabinet, with Labour leader Neil flown in by helicopter. The spectators were treated to a series of live performances from various singers and video endorsements on a huge screen above the stage from various "Labour luvvies" such as Juliet Stevenson and Sir Richard Attenborough. 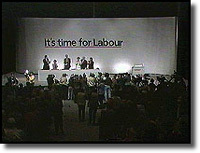 After about an hour Neil Kinnock and the Shadow Cabinet made their way to the platform from the back of the hall, with Mr Kinnock almost being mobbed by party members as he made his progress down the centre aisle. By the time he got to the stage Mr Kinnock was overwhelmed by the frenzied atmosphere in the hall. Standing at the podium he shouted out to the crowd "We're Alright! We're Alright!". He sounded like an evangelical preacher and the years of hard graft that had gone on before and during the campaign to show Mr Kinnock as a statesmanlike Prime Minister-in-waiting was laid to waste. Although those attending the rally, including some journalists, vouched that it had been a great success, the evening news bulletins carried pictures of an over-emotional Mr Kinnock which certainly did not enhance his image with the floating voters Labour so desperately needed to capture. Commentators said the rally looked triumphalist, a point echoed by several senior Labour politicians, and with the flags of the nations of Britain as well as the Union Jack fluttering ominously above the platform it was claimed Sheffield was reminiscent of a Nuremberg Rally. On the day of the Sheffield Rally, Wednesday 1 April, a number of polls appeared which for the first time seemed to show Labour taking a decisive lead. ICM showed Labour with a 4% lead, Harris with a 6% advantage and MORI with a 7% lead. However, by the following day an NOP poll showed the Labour lead at only 2%, while Gallup put the Tories 0.5%. According to Butler and Kavanagh the polls on Red Wednesday fuelled the triumphalism shown at the Sheffield Rally, waking the floating voters for the first time to the real possibility of a Labour win and sowing the seeds of Labour's defeat. "It's The Sun Wot Won It"
The tabloids were mostly hostile to Labour during the campaign but none was as violently anti-Labour, and particularly anti-Kinnock, as The Sun, the most widely read paper. On the day before polling The Sun ran eight pages of copy across which ran the banner headline "Nightmare on Kinnock Street". On polling day itself the front page of the Sun showed Neil Kinnock's head inside a lightbulb and the headline ran: "If Kinnock Wins Today Will The Last Person in Britain Please Turn Out The Lights". On the Saturday following polling day, The Sun headline read "It's The Sun Wot Won It". Such a proposition is highly questionable, but being read by 22% of the adult population The Sun was undoubtedly in a powerful position to sway a large number of voters. There is little evidence that newspapers have such direct influence but if they counted for anything during the 1992 campaign then The Sun certainly counted most.